ABC: DANCING WITH THE STARS dropped 0.1 from last week’s cycle premiere to 1.0, and THE CROSSING stayed at 0.5. CBS: The season finale of KEVIN CAN WAIT climbed 0.2 from last week to 1.0 (down 0.1 from 2017), and MAN WITH A PLAN was up 0.1 to 0.9. SUPERIOR DONUTS (0.7), the rerun BIG BANG THEORY (0.7) and ELEMENTARY (0.6) were steady with last week. NBC: THE VOICE dropped 0.2 to 1.5, and the season premiere of RUNNING WILD was at 0.9, the same as last week’s GOOD GIRLS finale. FOX: LUCIFER rose 0.1 to 0.7, and the just-renewed THE RESIDENT held at 0.8. CW: SUPERGIRL remained at 0.5, and IZOMBIE was up 0.1 to 0.3. CABLE HIGHLIGHTS: TNT had the night’s NBA PLAYOFFS games, with Toronto vs. Cleveland dominant at 2.25 over the 1.22 for Boston vs. Philadelphia. On VH1, LOVE & HIP-HOP shed 0.08 to 0.97, and the DEAR MAMA special was at 0.46, down 0.09 from the 2017 edition. 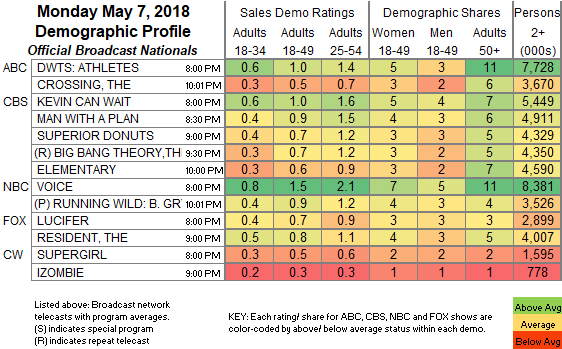 USA’s WWE telecast was at 0.91/0.90/0.88, compared to last week’s 1.13/1.08/1.03, and NINJA VS NINJA was down 0.05 to 0.24. NBC Sports Net’s NHL PLAYOFFS games were at 0.78/0.44. On MTV, TEEN MOM jumped 0.32 to 0.72, and YOUNG & PREGNANT was up 0.12 to 0.45, with an AFTER-SHOW at 0.33. On Bravo, VANDERPUMP RULES rose 0.08 to 0.67. On TBS, AMERICAN DAD gained 0.05 to 0.46, and the just-renewed FINAL SPACE was up 0.02 to 0.20. 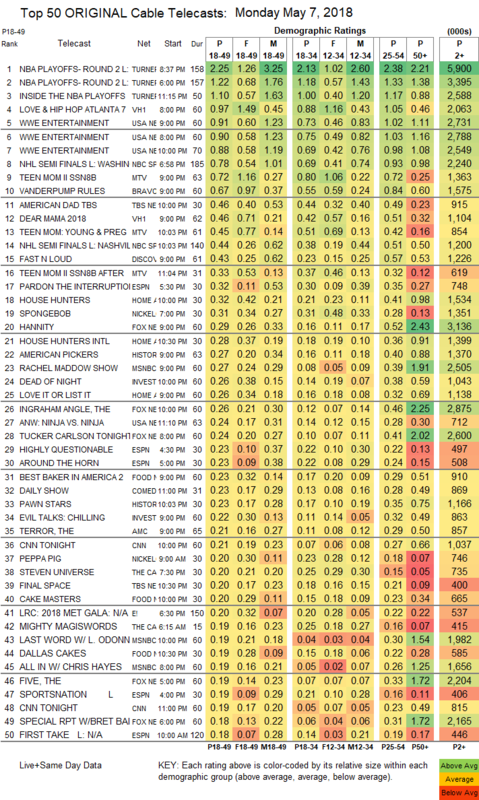 On Discovery, FAST N LOUD edged up 0.02 to 0.43. On HGTV, HOUSE HUNTERS was steady at 0.32, HOUSE HUNTERS INTL was up 0.02 to 0.28, and LOVE IT OR LIST IT was at 0.26. Nickelodeon’s SPONGEBOB was in the Top 19 at 0.31. Fox News’s HANNITY led cable news at 0.29/0.52/3.1M, with MSNBC’s RACHEL MADDOW SHOW at 0.29/0.39/2.5M, and CNN’s CNN TONIGHT at 0.21/0.27/1M. History’s AMERICAN PICKERS was at 0.26, and PAWN STARS was at 0.23. On ID, DEAD OF NIGHT lost 0.04 to 0.26, and EVIL TALKS ticked up to 0.22. On Food Network, BEST BAKER IN AMERICA was at 0.23, and CAKE MASTER was at 0.20, with DALLAS CAKES down 0.04 to 0.19. On AMC, THE TERROR shed 0.02 to 0.21, and STORY OF SCIENCE FICTION was down 0.03 to 0.09.